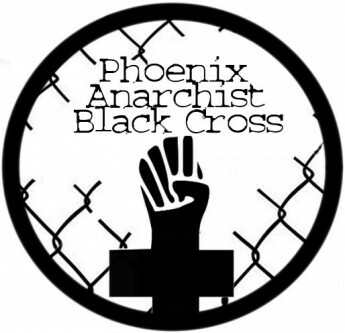 We are the Phoenix chapter of the Anarchist Black Cross- an international movement created to aid political prisoners, primarily anarchists. ABC started in the early 1900’s Russia as a reaction to the fact that the organizations, such as the Political Red Cross, created to aid political prisoners refused to give any help to the anarchists being locked up and tortured by the Tsar. The ABC, at the time the Anarchist Red Cross, itself became blacklisted and members, escaping punishment, fled to other parts of the world, bringing the black cross movement with them.